In honor of Black History Month, today we will take a look at the career of Tony McKegney. He was not the first black hockey player–or second, or third–to play in the NHL. 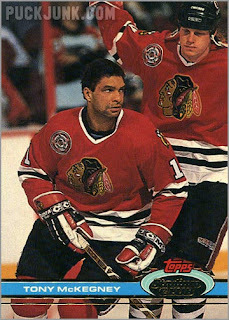 Rather, McKegney was the first black hockey player to make an impact in the NHL. Here are some of his trading cards issued during his 13-year NHL career. 1978-79 – McKegney played 52 games during his rookie season, scoring 22 points. 1979-80 – No, no card for Tony yet. In his first full NHL campaign, he scored 23 goals and 29 assists in 80 games. 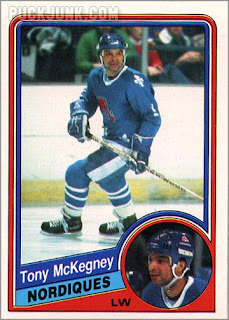 1980-81 Topps #144 – After two seasons in the NHL, McKegney finally got his rookie card. 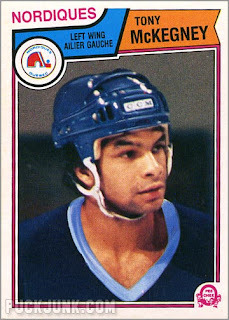 During the ’80-81 season, he scored 37 goals. 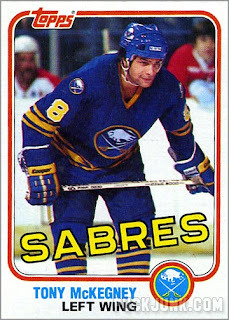 1981-82 Topps #76-East – McKegney tallied 23 goals this year. His card only appears in the “East” version of the Topps set. 1982-83 O-Pee-Chee #29 – An interesting photo of McKegney, sitting on the bench and smiling. In his 5th year in the NHL (and with Buffalo), he’d eclipse the 30-goal mark again by scoring 36 goals. 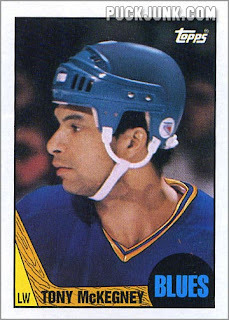 1983-84 O-Pee-Chee #296 – During the summer, McKegney was traded to the Quebec Nordiques. 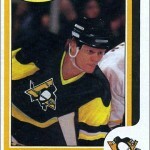 Thus, the card company attempted to recolor his jersey. They didn’t do a very good job. 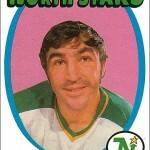 Tony, on the other hand, would, as he netted 24 goals that year. 1984-85 O-Pee-Chee #283 – McKegney played 30 games for Quebec, before getting traded to the Minnesota North Stars. Between both teams, he scored 23 goals. 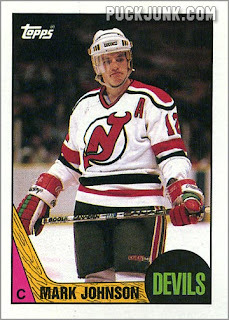 1985-86 Topps #156 – In a full season with Minnesota, McKegnney would only score 15 goals. 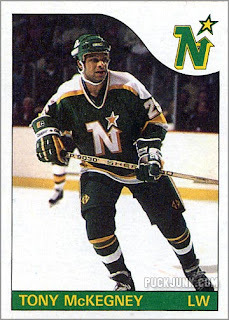 1986-87 O-Pee-Chee CUSTOM – After 11 games with the North Stars, McKegney was traded for the third time in his career, going to the New York Rangers. 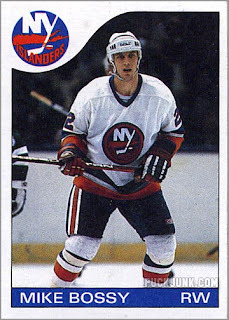 Neither Topps nor O-Pee-Chee issued a card of McKegney this year. 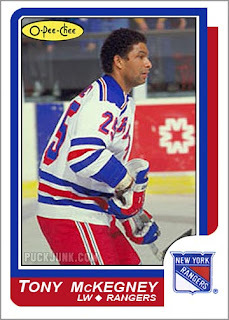 He also never had a card showing him with the Rangers. So, I made this nifty custom card to right those wrongs. This season, he scored 31 goals. 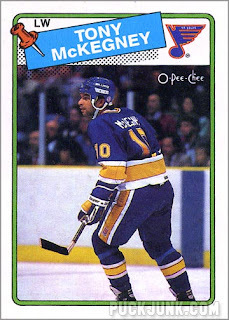 1987-88 Topps #172 – McKegney was on the move again, getting traded over the summer to the St. Louis Blues. Another offseason trade, and thus another airbrushed card. 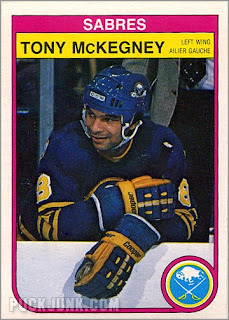 Topps almost did a good job of making McKegney actually look like he was with the Blues when this picture was taken. I say almost because they got the neckline right (more or less), but they forgot to airbrush out the Rangers logo on his helmet. By the way, this would be his best season offensively (40g, 38a, 78pts). 1989-90 Topps #4 – Wow! What are the odds that McKegney would be card number 4 in last year’s set and this year’s set? Anyway, due to being traded again over the summer, McKegney’s photo got the “airbrush treatment” a third time in his career. I think that’s some sort of hockey card record. 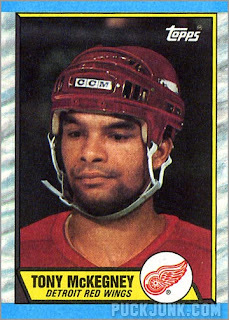 His career with the Detroit Red Wings lasted 14 games, before getting traded AGAIN to the Quebec Nordiques….AGAIN! 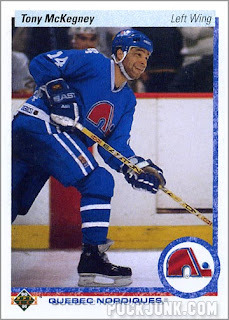 1990-91 Upper Deck #340 – After starting out strong with the Nordiques (17-16-33 in 50 games), McKegney got traded to the Chicago Blackhawks, where he’d spend his last 9 games (no goals, 1 assist). 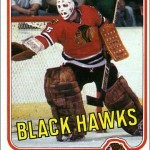 He also played 2 playoff games for the Blackhawks. I remember watching that playoff series. Though McKegney was scoreless during the playoffs, he still worked hard every shift he took. 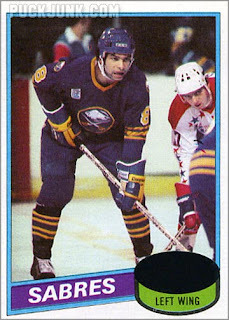 1991-92 Stadium Club #281 – This year, McKegney appeared in six different hockey card sets. Ironic, since at the time he was playing in Italy. He also played 3 games for the Canadian National Team, scoring 2 goals and 2 assists. 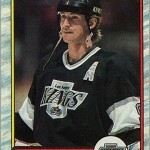 1992-93 – McKegney finished his pro career with the San Diego Gulls of the “old” IHL. In 13 NHL seasons, McKegney played in 913 games, scoring 320 goals and 319 assists for a total of 639 points. And in 9 of those seasons, he topped the 20 goal mark. All you the bloggers out there must be in my head because I had a post half typed up pretty much covering the same thing. Guess that one goes back into the vault.